Jump in to the Batting Order Baseball Experience. If you Beat my team, 1000 DFS TOKENS will be in your wallet! LAST NIGHT CAME DOWN TO THE WIRE! It literally came down to the last at bat of the night. Buster Posey hit a single which allowed Giancarlo Stanton to score from a double he hit earlier in the day in his last at bat, thanks to Trout with a meaningless single in his last at bat. Without Posey hitting the single around 10pm PST, Stanton would have been stranded on 3rd and AyWhall would have come in 2nd Place. Let me start out by saying, Josh Donaldson has a hit everyday this month, except for one game. Riding a 9 out of 10 game hitting streak dating back to last month, Donaldson is seeing the ball very well. He is hitting it very well, as well with 3 Bombs including a Grand Slam earlier this week. The Blue Jays facing Kevin Gausman who is struggling to regain the form that made him a top prospect a few years ago. Donaldson can easily take a curve or a cutter that does not move, and line it very hard all over the field. 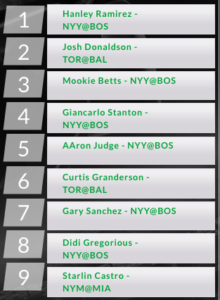 Make sure to grab Donaldson on your team. 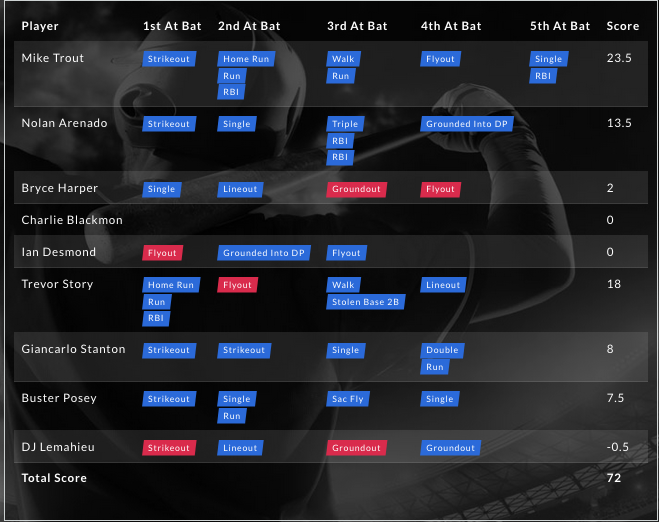 Putting all the hitters on my team that I feel can hit the ball in the front of my lineup. With all the players I hope that can do anything in the back of my lineup. It will be key for Stanton/Judge to produce when my runners get on base, but all it takes is one big hit from them to make something happen. Was contemplating throwing Granderson ahead of Stanton/Jude, but at the end of the day. How can you play Granderson ahead of those guys.